The Redguards of Hammerfell are masters of melee combat, athletic warriors who are raised to value dignity and honor. The Redguards are known to avoid magic and prefer to settle the score with steel. The roots of the Redguards are in the desert of Alik’r, but most Redguards live in two of the biggest cities of the province of Hammerfell: the capital and merchant port Sentinel and Hallin’s Stand. Redguards are hardy people who are used to harsh environments. Young Redguards still endure a rite of passage in Alik’r, the largest desert in all of Tamriel. This ritual tests the discipline and endurance of young Redguards. Some make it, some don’t. Those who do make it are destined to become great warriors. Redguards are members of the Daggerfall Covenant together with Bretons and Orcs. The symbol of Redguards in Elder Scrolls Online is a shield surrounded by three curved swords. 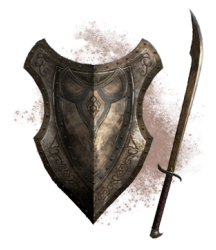 Redguards receive an increased experience gain bonus with the One Hand and Shield skill line, and the racial skill Vigor, identical to the skill of the Wood Elves, increases their stamina recovery while in combat. Conditioning is a racial skill which increases maximum Stamina. The last racial skill the Redguards possess is called Adrenaline Rush, which restores stamina when damaging melee attacks land on enemies. The racial skills of Redguards have high emphasis on Stamina. Redguard may well be the race of choice for players who prefer melee combat.